14 Reasons to Quit Smoking! 8. Health Risks to Your Family: Passive smoking to an extent carries all the hazards of smoking. In addition, children of parents who smoke have a higher rate of sore throats, coughs, colds, and ear infections. Babies of mothers who smoke are at an increased risk of a sudden infant death syndrome (SID). Evidence also suggests that tobacco smoke makes babies more prone to colic. 9. Blindness: Smokers are at an increased risk of age-related macular degeneration, a severe and progressive eye disease that leads to loss of vision. 10. Rheumatoid Arthritis: If you have a genetic tendency to develop rheumatoid arthritis, smoking will further increase your risk manifold. 11. Snoring: Studies show that people who smoke tend to snore much more than those who do not, which could be associated with a poorer quality of sleep. Even people exposed to second hand smoke snore more than those who are not. 12. Acid Reflux: Smoking puts you at risk of developing gastro-esophageal reflux disease (GERD), which manifests as heartburn. 13. Breast Cancer: Studies also indicate that women who smoke maybe at an increased risk of breast cancer. Women who start smoking before 20 years of age or those who smoke more than 20 cigarettes in a day are at a greater risk. Better health is undoubtedly an overwhelming benefit of quitting smoking. 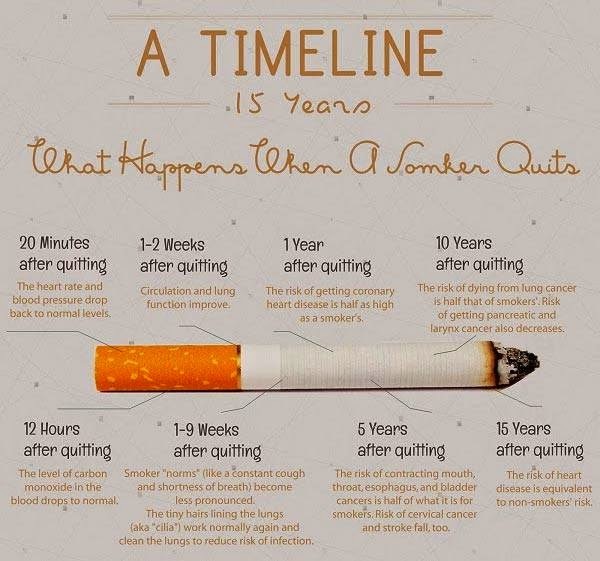 But there are yet more ways in which quitting smoking will change your life for the better. Take a look. You will not be a bad example for your children and younger siblings. You will save substantial amount of money. You will feel more energetic every day. Your performance and endurance at all sports and activities will improve. You will save your skin from premature ageing. You will be able to appreciate good smell and taste better. Your teeth and nails will not look yellow and unattractive. You will not get disgusted looks from people because of your bad breath. You will not have to deal with disapproval and nagging from family and friends. You will have a more positive self-image and more confidence in your will-power.